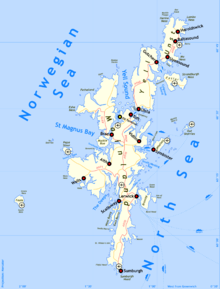 Shetland (or the Shetland Islands) is an archipelago, the furthest out part of Scotland. The islands are between the Faroe Islands and the Orkney Islands. They are about 50 miles to the northeast of the Orkney Islands. They are about 100 islands in the group. People live on 16 of them. The islands form part of the boundary between the Atlantic Ocean to the west, and the North Sea to the east. The largest islands of the group are Mainland, Yell, Unst, Fetlar, Whalsay, and Bressay. In general, the climate of the group is subarctic, and rather bleak. They used to be called Hjaltland or Zetland. Today, the islands are part of Scotland. The administrative centre is Lerwick. The economy of the islands is largely based on agriculture. The sheep are known for their fine wool. Other well-known exports are the Shetland ponies and Shetland Sheepdog. In 1969 crude oil was discovered near the islands, leading to an alternative source of income for them. Harald Hårfagre took control of Hjaltland in ca 875. From an Icelandic manuscript of the 1400s. By the end of the 9th century the Norsemen shifted from plundering to invasion, mainly due to the overpopulation of Scandinavia in comparison to resources and arable land available there. Shetland was colonised by Norsemen in the 9th century. The fate of the native population is unknown. The colonisers established their laws and language. That language evolved into the West Nordic language Norn, which survived into the 19th century. After Harald Finehair took control of all Norway, many of his opponents fled, some to Orkney and Shetland. From the Northern Isles they continued to raid Scotland and Norway, prompting Harald Hårfagre to raise a large fleet which he sailed to the islands. In about 875 he and his forces took control of Shetland and Orkney. Ragnvald, Earl of Møre received Orkney and Shetland as an earldom from the king as reparation for his son's being killed in battle in Scotland. 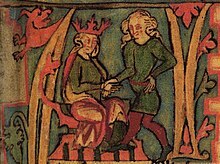 Ragnvald gave the earldom to his brother Sigurd the Mighty. Shetland was Christianised in the 10th century. In the Treaty of Perth in 1266 the Norwegian king surrendered his furthest British islands to Scotland. They included the Hebrides, and the Isle of Man. In return, the Scots recognised Norwegian sovereignty over Orkney and Shetland. The islands did not become Scottish until the 15th century, and were ratified by an Act of Parliament in 1669. For three centuries the Shetlanders sold their fish (salted cod) through the German Hanseatic League, a trading organisation. This arrangement lasted from 1400 to 1700 AD. In WWII the Shetlands were active in covert operations against the Germans in Norway. The 'Shetland Bus' (fishing vessels) sailed in covert operations between Norway and Shetland. They carried intelligence agents, refugees, instructors for the resistance, and military supplies. Many people on the run from the Germans, and much important information on German activity in Norway, were brought back to the Allies this way. In the early 1970s, oil and gas were found off Shetland. The East Shetland Basin is one of the largest petroleum sedimentary basins in Europe. Sullom Voe terminal opened in 1978 and is the largest oil export harbour in the United Kingdom with a volume of 25 million tons per year. Firm geological evidence shows that at around 6100 BC a tsunami caused by the Storegga Slides hit Shetland, as well as the rest of the east coast of Scotland, and may have washed over some of the Shetland Islands completely. Shetland has been populated since at least 3400 BC. The early people subsisted on cattle-farming and agriculture. During the Bronze Age, around 2000 BC, the climate cooled and the population moved to the coast. During the Iron Age, many stone fortresses were erected, some ruins of which remain today. Due to the practice of building in stone on the virtually tree-less islands, Shetland is extremely rich in physical remains of all these periods, though Shetland is less rich in material remains than Orkney. The artifacts of all the eras of Shetland's past can be studied at the newly built (2007) Shetland Museum in Lerwick. ↑ Smith, David "Tsunami hazards". Fettes.com. Retrieved 5 February 2008. ↑ The Scourd of Brouster site in Walls includes a cluster of six or seven walled fields and three stone circular houses that contains the earliest hoe-blades found so far in Scotland. Clarke P.A. 1995. Observations of social change in Prehistoric Orkney and Shetland, based on a study of the types and context of coarse stone artefacts. M. Litt. thesis. University of Glasgow.